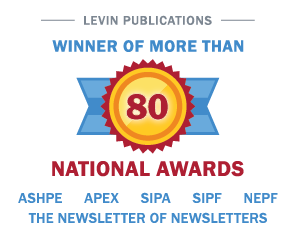 The latest news from Irving Levin Associates, the leading publisher of business intelligence for investors in Seniors Housing and Health Care M&A and Finance. April 10, 2019 – 2018 Health Care Services M&A Market Surpasses 2017 Deal Volume, According to Irving Levin Associates, Inc.
March 8, 2018– Newly Published: 2017 Health Care Services M&A Market Equals 2016 Deal Volume, According to Irving Levin Associates, Inc.
May 25, 2016 Assisted Living and Medicaid: Will it Harm a Great Product? May 11, 2016 Physician Medical Group M&A Activity Declined in Q1:2016, According to Acquisition Data from Irving Levin Associates, Inc.
May 10, 2016 Home Health and Hospice M&A Activity Jumps in Q1: 2016, According to Acquisition Data from Irving Levin Associates, Inc.
April 11, 2016 Newly Published: 2015 Health Care Services M&A Market Sees Growth in Deal Volume and Value of Transactions, According to Irving Levin Associates, Inc.
March 31, 2015 Newly Published Report: 2014 Health Care Services M&A Market Sees Growth In Deal Volume And Value Of Transactions, According To Irving Levin Associates, Inc.
February 12, 2015 Senior Care M&A Market: Reaching a Peak? January 6. 2015 Memory Care Development: Build, Buy, or Convert? July 17, 2014 Senior Care M&A Activity at Record Levels According to Acquisition Data from Irving Levin Associates, Inc.
May 29, 2014 Dual-Eligible Integration Projects: What Does It Mean For You? May 8, 2014 Newly Published Report: 2013 Health Care Services M&A Market Rebounds Slightly With Small Increase in Dollar Value of Transactions, According to Irving Levin Associates, Inc.
January 9, 2014 Build or Join an ACO-Don’t Let the Opportunity Pass You By! July 29, 2013 Health Care M&A Spending Grows in Q2 2013, Compared with Q1 2013, According to Irving Levin Associates, Inc.
May 30, 2013 Boost Your Bottom Line: Go Green! April 25, 2013 Health Care M&A Spending Falls 50% in Q1 2013, Compared with Q1 2012, According to Irving Levin Associates, Inc.
February 28, 2013 Development Strategies: Expand, Build or Buy? January 23, 2013 Acute Care and Post-Acute Care Integration: What Does It Mean For You? January 21, 2013 Health Care Mergers and Acquisitions Falls Nearly 40% In 2012, Lowest Year On Record Since 2003, According to Irving Levin Associates, Inc.
October 25, 2012 Health Care Mergers And Acquisitions Decline In the Third Quarter 2012, According To New Report From Irving Levin Associates, INC.
August 23, 2012 M&A Market: Holding Steady, But Ready To Surge? July 19, 2012 Dollar Volume Of Health Care Mergers and Acquisitions Doubles In The Second Quarter Of 2012, According To New Report From Irving Levin Associates, Inc.
January 25, 2012 Health Care M&A Spending Rises 11% in 2011 According to New Report from Irving Levin Associates, Inc.
October 17, 2011 Health Care Mergers and Acquisitions Poised for 20 Percent Growth, According to New Report from Irving Levin Associates, Inc.
August 16, 2011 Seniors Housing M&A Mid-Year Review and Outlook: Will Housing Market Woes and Medicare Cuts Keep Activity Down? July 14, 2011 Health Care M&A Activity in Second Quarter Points to a Record Year, According to New Report From Irving Levin Associates, Inc.
April 19, 2011 Health Care M&A Makes a Strong Showing in First Quarter 2011 According to a New Report from Irving Levin Associates, Inc.
March 31, 2011 Health Care Services M&A Rebounds Strongly in 2010, According to Irving Levin Associates, Inc.
March 3, 2011 Skilled Nursing Prices Set New Record in 2010, While Assisted Living Prices Fall Slightly, According to New Report from Irving Levin Associates, Inc.
January 20, 2011 Heath Care M&A Activity for 2010 Remains Strong, According to New Report from Irving Levin Associates, Inc.
October 20, 2010 Spending on Health Care Mergers and Acquisitions Rises 44 Percent According to New Report by Irving Levin Associates, Inc.
July 28, 2010 Health Care M&A Accelerates In Second Quarter After Passage of Reform According to New Report by Irving Levin Associates, Inc.
March 30, 2010 Health Care Services M&A Set For Rebound After Decline in 2009, According to Irving Levin Associates, Inc.
March 8, 2010 Skilled Nursing Prices Rise, Assisted Living Prices Fall in 2009, According to New Report from Irving Levin Associates, Inc.
January 19, 2010 Health Care M&A For 2009 Reaches Second Highest Level in Decade, According to New Report from Irving Levin Associates, Inc.
Report From Irving Levin Associates, Inc.
March 26, 2009 Health Care Services M&A Focuses on Middle Market in 2008, According to Irving Levin Associates, Inc.
March 12, 2009 Skilled Nursing, Assisted Living and Independent Living Community Prices All Drop In 2008 From Record Levels Set In 2007, According To New Report From Irving Levin Associates, Inc.
January 16, 2009 Biotech Leads 2008 Health Care M&A to Near Record Levels, According to New Report From Irving Levin Associates, Inc.
October 8, 2008 Third Quarter Health Care M&A Bucks Market Meltdown, According to New Report From Irving Levin Associates, Inc.
July 9, 2008 Health Care M&A Strongest In Years, According to New Report From Irving Levin Associates, Inc.
April 15, 2008 Despite First Quarter Decline, Health Care M&A Remains Robust, According to New Report from Irving Levin Associates, Inc.
March 25, 2008 Health Care Services M&A Posts Second Highest Dollar Level in 2007, According to Irving Levin Associates, Inc.
March 10, 2008 Skilled Nursing Facility Prices Hit Record in 2007, Assisted and Independent Living Facility Prices also Hit Record Levels in 2007, According to Irving Levin Associates, Inc.
January 10, 2008 Health Care M&A Dollars Reach Second Highest Level Ever in 2007, According to New Report from Irving Levin Associates, Inc.
October 9, 2007 M&A Health Care Merger and Acquisition Activity Strong in Third Quarter 2007, Year Already Second-Largest Ever in Health Care M&A According to New Report From Irving Levin Associates, Inc.
July 12, 2007 Health Care M&A Dollars Keep Flowing in Second Quarter 2007 According to New Report from Irving Levin Associates, Inc.
April 16, 2007 Health Care M&A Dollar Volume Remains Strong in First Quarter 2007 According to New Report From Irving Levin Associates, Inc.
March 1, 2007 Skilled Nursing Facility Prices Hit Record in 2006, Assisted and Independent Living Facility Prices Near Record Levels in 2006 According to New Report From Irving Levin Associates, Inc.
January 11, 2007 Health Care M&A Dollars Spent in 2006 Shatters Previous Record According to New Report From Irving Levin Associates, Inc.
January 11, 2007 Year-End 2006 Health Care Venture Capital Results Up Again, According to New Report From Irving Levin Associates, Inc.
October 5, 2006 Health Care M&A Dollar Value Surges in the Third Quarter of 2006 According to New Report From Irving Levin Associates, Inc.
July 13, 2006 Health Care Merger and Acquisition Activity Soars in Second Quarter 2006, According to Irving Levin Associates, Inc.
April 18, 2006 Health Care Merger and Acquisition Activity Strong in First Quarter of 2006, According to Irving Levin Associates, Inc.
April 5, 2006 Venture Capital Funding Rises for Health Care in First Quarter 2006, According to Irving Levin Associates, Inc.
March 22, 2006 M&A Activity for Health Care Services Rises 19% in 2005, According to Irving Levin Associates, Inc.
March 7, 2006 Assisted Living and Independent Living Facility Prices Soared to Record Levels in 2005, According to New Report from Irving Levin Associates, Inc.
January 12, 2006 Health Care Merger and Acquisition Activity Reaches Five-Year High in 2005, According to Irving Levin Associates, Inc.
October 12, 2005 Health Care Merger and Acquisition Activity Surges in Third Quarter 2005, According to Irving Levin Associates, Inc.
July 14, 2005 Health Care M&A Market Heats Up and VC Funding Keeps Flowing for Biopharmaceuticals and Biotechnology Deals, According to Irving Levin Associates, Inc.
July 14, 2005 Steady Flow of Medical Devices Deals and Surge in Funding Indicate Sector Stability, According to Irving Levin Associates, Inc.
July 14, 2005 Venture Capital Slumping, Demand for Acquisitions Shifting in Pharmaceutical Sector, According to Irving Levin Associates, Inc.
July 12, 2005 Healthcare M&A In Second Quarter 2005, According to Irving Levin Associates, Inc.
April 15, 2005 Health Care Mergers & Acquisitions Reach Highest Level in Two Years According to Irving Levin Associates, Inc.
April 8, 2005 Health Care Venture Capital Spending Rises 19% in First Quarter 2005, According to Irving Levin Associates, Inc.
March 23, 2005 Hospital M&A Activity Rebounds in 2004, Other Health Care Services Sectors Are a Mixed Bag, According to Irving Levin Associates, Inc.
March 9, 2005 Skilled Nursing and Assisted Living Facility Prices Soar in 2004 to Record Levels According to New Report from Irving Levin Associates, Inc.
January 12, 2005 Health Care Venture Capital Funding Reaches Highest Level in Three Years, According to Irving Levin Associates, Inc.
January 7, 2005 Fourth Quarter 2004 Caps Off a Record Year in Health Care M&A, According to New Report from Irving Levin Associates, Inc.
January 6, 2005 Health Care Venture Capital Investments Increased 23% in 2004, According to Irving Levin Associates, Inc.